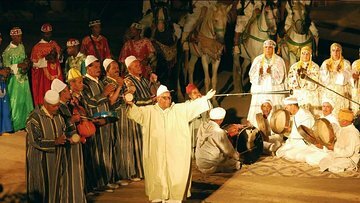 Danzas tradicionales, elegantes acrobacias y música en directo resucitan la antigua magia de Marrakech en Chez Ali. Garantizamos la entrada a esta popular atracción de Marrakech mediante la reserva de entradas con antelación, con la posibilidad de optar por incluir la cena, recogida y traslado de vuelta al hotel. Entrada a la actuación de Chez Ali. Siéntese en un festín de platos tradicionales marroquíes en un palmeral con cena opcional. Baila toda la noche con una tropa de bailarinas, acróbatas y músicos. Mejora opcional para incluir la cena y la recogida y recogida en el hotel. Unbelievable show and place!!!!! Wonderful transfers, on time and pleasant. They give you planty of time to walk around, take pictures, etc. then you go inside this tents that serve as dinning rooms. they serve Marrakech typical food, you are seating with people from your ride. there are groups of dancers and singers coming to each table, they invite you to dance with them. After dinner, you go to the arena, where they perform with horses and music and rifles, etc. Quite enjoyable. It's a big production. Some of the singing when they came to your table begging for tips was annoying. I do not think it's worth more than the 3 stars I give it, the food was terrible, too cooked, I think it was not completely fresh, as for the show, it leaves a lot to be desired. Maybe it was because of the holidays or because it was winter, but I do not recommend it for the money that is paid. They also charged me twice for the same thing. Very entertaining show with a decent dinner and attentive staff. Make sure you bring extra layers depending on the time of year as it gets pretty chilly watching the show. Some of the reviews we had read didnt do this show justice. The location was surreal and the whole evening was a fun night out. This place was terrible. The bad communication and lack of planning for pick up created a negative vibe that just persisted through the entire evening. The Opening event when you meet the dancers was not only disappointing but frustrating when they began asking us for money. There were no acts as advertised during the dinner but again the same tired dancers that kept asking for money followed by the photographer who also asked for money. The persons serving the food focused only on the groups ordering several drinks that seemed like they would tip more. The meal was one Tangine of overly fatty lamb and some sad unflavored cous cous. The heaters were turned off so it was freezing in the building and our less than satisfying meal ended with a couple of stale cookies with fruit. When they brought us tea it was a glass filled up to one fourth of the cup. When we asked for more tea the host went to another table and took two used glasses and brought back tea. We refused to drink it. Once we got up to leave we were again asked for money which was totally unbelievable given the horrid service.The arena show seemed pointless and had horrible lighting which made it difficult to see the acts as they performed which mainly consisted of the men on horseback riding up and down the arena and shooting guns which must have been a night mare for the animals. It was the worst food and treatment we have ever received on this type of tour.